Monster High Catty Noir Doll: All ghouls will shout Me-WOW over the coolest werecat on campus. Since her debut on Friday the 13th, the superstitious, Catty Noir has been a hissing-fit of glitz and haunt cattoure. 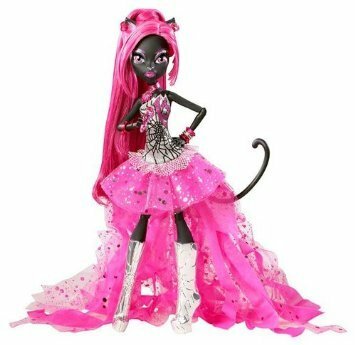 The newest character - and pop star - at Monster High has sleek black skin that blends right into the night for secret feline fun and is also dressed to impress for day play or out-on-the-town adventures with her BFF (beast friends forever). She’s rocking a hot pink tulle skirt with jagged layers, fierce flounces and a silver bodice emblazoned with a creepy cool spider web and bold lucky number thirteen. Her shiny silver knee-high boots, long magenta mane, multiple cat ear piercings and hip arm bangles complete her sensationally cat-hip ensemble.